It's an Orange County tradition! 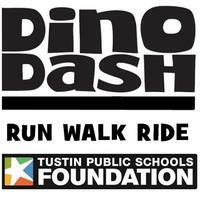 Now in its 29th year, the Dinosaur Dash is a community run, walk, and bike event benefiting the Tustin Public Schools Foundation. 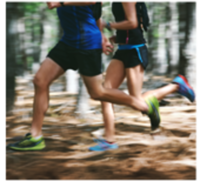 There's something for everyone - a 2k fun run, chip-timed, 5k, 10k and half marathon runs and Bike Tours for all riding levels (50k, 15k, and a family-friendly 5k). Our Half includes a Jurassic-size finisher's medal! The finisher medal for the 10k, 5k, and Bike Tour features our unique, student-designed logo. The 5k, 10k and Half top finishers in each racing age division will receive the official Dino Dash trophy - hand-made by Tustin Unified students. Second- and third-place finishers will receive a medal. 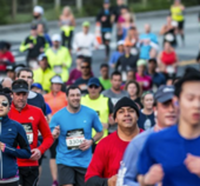 The 2k Fun Run and the Bike Tour are not timed, and do not have age division awards. The 50k bike tour is a metric half-century ride that tours Santiago Canyon from the City of Orange side to Foothill Ranch. Riders will skirt the old El Toro Marine Base and the Great Park before returning to The Market Place in Tustin. This tour is recommended for riders age 13 and up. A shorter 15k bike tour is available, as is a family-friendly 5K tour on closed roads. The Bike Tours are not timed. A free family Expo will be open 7 a.m.-11 a.m. The Expo will offer activities, school fundraising booths, exhibitors and a Food Court featuring bites from local restaurants. The Tustin Public Schools Foundation is a charitable organization that supports the students and teachers of Tustin Unified's schools by funding grants, scholarships, and enrichment programs such as after-school sports, robotics, college readiness, Tustin Summer Academy, and more.